Picture from group : It looks better here than in reality! Picture: It looks better here than in reality! 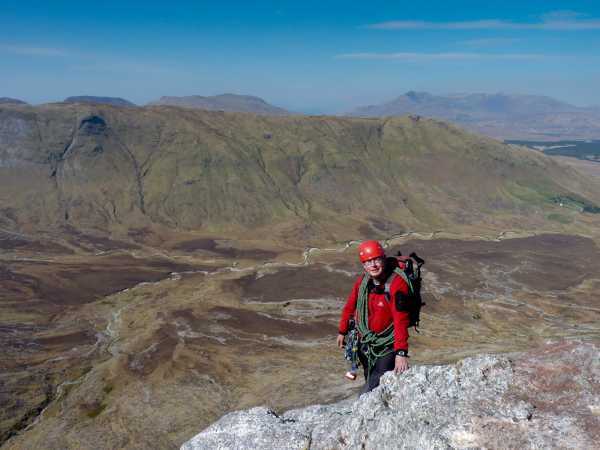 There are few easy ways to climb the Twelve Bens but why take an easy way when there is a more challenging route? 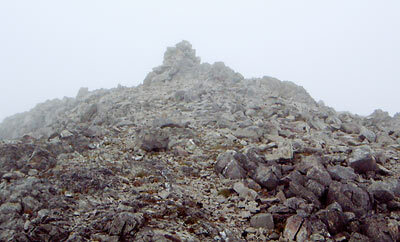 In this case the challenge was Carrot Ridge which snakes up the northern face of Binn an tSaigdiúra (a subsidiary peak of Ben Corr). Carrot Ridge is the longest rock climb in Ireland and some say one of the best ridge climbs at its grade (Difficult) in the British Isles. 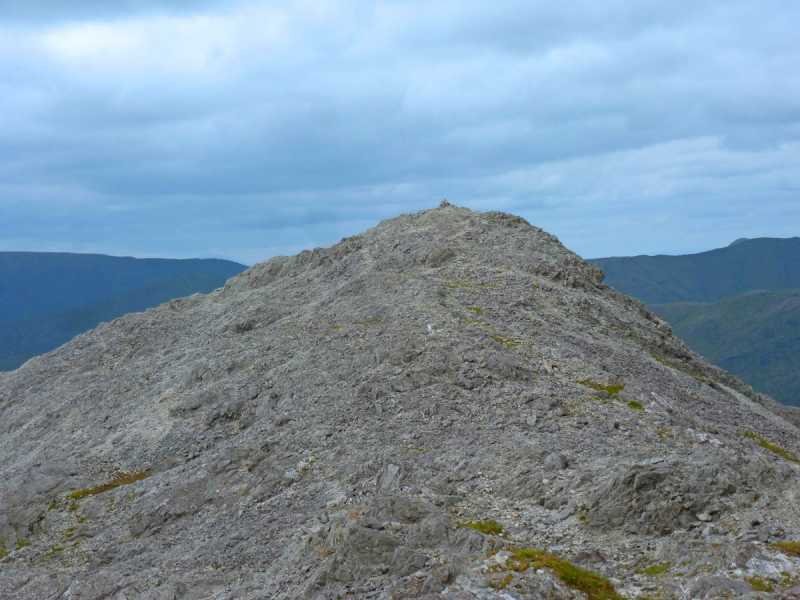 A good description of Carrot Ridge can be found in Dan Bailey’s book “The Ridges of England, Wales and Ireland - Scrambles and Climbs” published by Cicerone in 2009. On a glorious sunny day on 10th April 2010 we parked near to the bridge over the Tooreenacoona River on the R334 and then walked along the road northwards for about a kilometre before taking a farm track/footpath which leads SW into the Gleninagh Valley. About 2km from the R334 we left the footpath and veered southwards across the Gleninagh River before walking steeply up the lower slopes of Binn an tSaigdiúra and Bencorrbeg to the foot of Carrot Ridge at L811 532 F. Then it was time to don our climbing gear – harness, helmet, climbing shoes, slings, nuts and a climbing rope. Carrot Ridge although at the lower grade of climbing is still a serious undertaking and the correct equipment and experience is needed. This was my first serious rock climb after nearly a 30 year gap and as leader I felt a bit of apprehension before starting the climb. 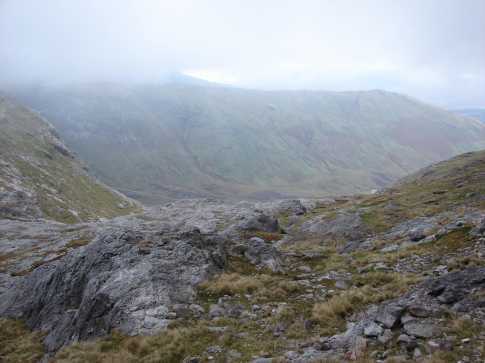 The first two pitches of Carrot Ridge (each of about 25m) follow the pinkish quartzite slab at the base of the climb. The second pitch proved the trickiest with a Very Difficult move from the belay position above the first pitch into a groove on the right. Once in the groove the going got better but there is little protection for the leader on this 25m pitch. The third and fourth pitches are quite easy and lead to a short traverse, a corner below the First Step. The corner is easily climbed (fifth pitch) and is followed a short walk to a 15m chimney (sixth pitch). Climbing the chimney proved to be perhaps the most difficult bit of the climb, partly because the rucksacks on our backs made the tactic of back-and-footing up the chimney almost impossible. We had to revert to hand jamming in the chimney crack and groping for scarce handholds on the rock at the top of the chimney.